Applying for your dream job can be stressful. And while candidates have the advantage in today’s competitive job market, it’s still hard to land coveted positions. So how do you make your resume stand out among hundreds of applicants? Hiring managers don’t have a ton of time to thoroughly look over each resume, which means you have to be judicious about what to include. From choosing the right font to deciding whether or not to include that internship, creating a resume in 2019 isn’t easy. Beyond the basics, a resume should be the space to communicate your story, says Julie Kim, a Senior Recruiter at Jun Group, an advertising agency based in New York City. Your resume should reflect more than just what you did. A good resume includes specifics on what you’ve actually accomplished throughout your career, says Traci Schweikert, Vice President of Human Resources at POLITICO. If you’re looking to make your resume stand out, consider these six tips from HR executives. Kim agrees that resume layout is wholly dependent on the position you are applying for. “If you are applying for a designer role, I want to see something creative there. If you’re applying for a finance role, I want to see numbers,” she says. One of the best ways to make your resume stand out is to use the job posting as a guide. Schweikert says that she often tells people that is the first place they should look when revamping their resume. Some companies actually conduct keyword searches when sorting through resumes, Schweikert adds, which means those terms are even more important to include if you want to secure an interview. It may sound tedious, but taking the time to customize your resume for each individual job you apply to is a surefire tactic to stand out among the pack of applicants, she says. It can be difficult to view your resume from a hiring manager‘s perspective — but one thing many employers agree on is that simplicity goes a long way. For starters, you never know exactly how a hiring manager will be reading your resume; they may pull it up on their phone, or go through an applicant tracking system. Schweikert suggests sticking to clean and simple resumes, since they are legible across all platforms. Hyperlinking to your portfolio or LinkedIn profile instead of including that information elsewhere on your resume is also an easy way to preserve space, she says. Format and font are important, too. Kim says that she likes to see all titles in bold, because they catch her eye. And again, unless you are applying for a creative position, stick to a monochromatic color palette. Whether you’re switching careers or feel slightly underqualified for the job you are applying for, Kim suggests including an objective at the top of your resume. This will help hiring managers understand the thought process behind your decision to change industries or why you are applying for the job. She says you can fill the gaps in between your experience by detailing the inspiration and motivation behind your move. This objective statement should be limited to two or three sentences explaining what you are trying to accomplish and what you can contribute, Kim says. Take the time to go beyond the job description and do your research on the company. Schweikert suggests simply going on the company’s career website to see what their values are. In addition to including your professional experience on your resume, think about including information relevant to that company’s culture. For example, if you see that a company participates in a significant amount of charitable work and you have volunteer experience, consider adding that to your resume, Schweikert says. And even if the company doesn’t mention anything about volunteering, you may want to include it anyway — about 80% of “hiring influencers” (employees who have the ability to influence the hiring process), indicated that they believe there is a relationship between volunteering and leadership ability, according to a 2016 Deloitte survey. Arranging informational interviews with people you are connected to can also help your resume stand out, according to Schweikert. Most applications are submitted online, and the volume of resumes that hiring managers must sift through can be overwhelming at times — so establishing a personal connection can help you get noticed, she says. Plus, if you are invited in for an official interview, you can bring up what you discussed at the informational one. “You can say, ‘hey I did a lot of research on the organization and met with Susie Q and they shared this with me,’” Schweikert says. After your informational interview, you can reach out to that contact and ask that they glance over your resume, making sure to pose as many specific questions as possible about how you should tailor your resume to the company or specific role, Schweikert adds. For example, if you are struggling to decide whether to include your college activities on your resume, reaching out to your connection for advice can provide invaluable insight on whether that might be important to that company. Kim also encourages informational interviews, as they are a great opportunity to learn more about an industry, company or specific role. There is also significant value in having someone else look over your resume. “A second pair of eyes can bring a lot of fresh perspective,” she says. So, you have just spent the last 45 minutes answering countless questions about yourself and why you’re the perfect candidate for the role. As they utter “do you have any questions?”, you breathe a sigh of relief, as this is a good indication that the interview is almost over. Hold that thought – this is not the case. Asking questions is just as important as the interview itself – done right, it’s a great way of showing your individuality and acts as a differentiator between you and other candidates. Clients will often asses the type of questions you ask as a good measure of the depth of research you have done, your commerciality and strategic thinking. Understand what makes the company different to others in their space, USPs, latest news press or acquisitions, accolades and values! Research until you find something you are genuinely passionate about as this will translate with more credibility and align yourself with their values or mission. An interview is not an interrogation, it’s a two-way conversation and in this market, you are looking for a demonstration that the business is a good fit for you, just as they are vice versa. Before we dive into the best questions to ask to really impress your interviewer, below are some of the deadliest questions to avoid at all costs. No matter how bad you think the interview went or how much you want to run a mile without looking back, asking an insightful question will always convey your hunger for the role. ‘I don’t have any questions’ is the worst possible response to have. As much as first impressions are crucial, final impressions really do count too. It’s important that you prepare some thought-out questions to show you have done your homework and are totally engaged in the company and the role. Although you may be asked about your salary expectations during the interview, NEVER ask ‘how much will I be getting paid?’. Not only does it convey that you care more about how much is going into your bank account each month rather than driving company success, you may be jumping the gun. A salary can then be negotiated, dependant on your previous experience and skills – but wait until the offer comes, or at the very least, your salary expectations are asked. #3 When can I take a holiday? Asking for personal requests before you have even stepped through the door is treading on thin ice. Vacations, annual leave or sick pay should be avoided, (unless of course, you have a medical requirement that the client would need to know of). Asking such questions shows a sluggish attitude and lack of commitment to the role, something no hiring manager wants to see. Now you know what not to ask, here are some of the best questions to ask which will really impress your hiring manager. This is a great opportunity for the interviewer to touch on anything that may have been unclear or briefly mentioned. Any reservations can be rectified, increasing the chances of getting to the next stage and putting you back in the running for your dream job! Like most people, everyone loves talking about themselves. So, when this question is brought up, you most definitely will see a smile seep across the interviewer’s face! It opens a dialogue on a more personal level – they know everything about you, so here is your chance to get to know everything about them, especially if they are potentially your future boss. This question is a good indication to the interviewer that you are driven and focused on becoming a valued asset to the company and you’re ready to take on opportunities from the get-go. It allows you to visualise how ambitious the company is and where it sets its sights on over the next coming months/years. It may be wise to offer up any insights you found in your research to show you have done your due diligence and are intrigued to find out more. Finding and preparing questions to ask your interviewer is just as important as prepping for the interview itself, therefore I would recommend preparing 2-3 questions beforehand (just in case anything you may have wanted to ask has already been covered). Overall, it’s just as important to finish strong as well as excelling the main part of the interview. Every company you apply to will work differently, so make sure you tailor your questions to fit the company perfectly. This concluding piece can really stoop some people. Close strong. Strut out of there knowing you nailed it and left a lasting impression! In an ever-changing business climate, keeping your skills current and flexible is crucial to secure a good role and be successful. Core skills such as marketing, financials, project management, leadership, problem-solving and so on are no longer enough – a blend of additional soft skills are crucial to navigating the current business landscape. The umbrella of communication covers a wide range of skills. Effective communication goes further than the verbal, non-verbal and written categories. Skills in listening, empathy, respect, friendliness and clarity are expected skills. But in any industry, employees are expected to engage with people from all backgrounds, ages, and cultures, and being able to connect with as wide a variety of people as possible is a valuable skill. Being able to adapt your communications skills to suit your customers, co-workers and in some cases, your location will widen opportunities to work within different cultures. Cultural competence is often overlooked as a key leadership skill. Developing it relies on the observation of customs and etiquette in order to do business with confidence. A key skill that has expanded in recent years is the ability to analyse data. Once confined to the IT sector, these skills are now applied to sales, marketing and human resources, or any area of business that produces data. Data analysis doesn’t just help target customers, but can also be used to identify strengths to build on and weaknesses to address, to make the business stronger. If you’re looking to develop skills in data analytics, it’s advisable to enroll on a good course to get started. There are also good resources around the web to help build on this valuable skill. Don’t be a dinosaur. The willingness to learn and reinvent yourself is a skill in itself. Broaden your horizons, update your existing skill sets, and don’t be afraid of change. Employers are more likely to take on candidates with a flexible attitude and an appetite for developing new skills. Whatever stage you are at in your career, whether you’re just starting out or nearing retirement, the ability to adapt will help you keep pace. It’s important to keep your skills fresh and relevant not just to the industry you’re working in, but to the general social climate, too. Whether these skills come naturally or not, don’t be afraid to do research, attend courses and gain experience. Make sure you detail them on your C.V. to market yourself when you’re applying for a new role. The pace of development for the Indian banking industry has been tremendous over the past decade. As the world reels from the global financial meltdown, India’s banking sector has been one of the very few to actually maintain resilience while continuing to provide growth opportunities, a feat unlikely to be matched by other developed markets around the world. FICCI conducted a survey on the Indian Banking Industry to assess the competitive advantage offered by the banking sector, as well as the policies and structures required to further stimulate the pace of growth. A majority of the respondents, almost 69% of them, felt that the Indian banking Industry was in a very good to excellent shape, with a further 25% feeling it was in good shape and only 6.25% of the respondents feeling that the performance of the industry was just average. This optimism is reflected in the fact that 53.33% of respondents were confident I a growth rate of 15-20% for the banking industry in 2009-10 and a greater than 20% growth rate for 2014-15. Some of the major strengths of the Indian banking industry, which makes it resilient in the current economic climate as highlighted by our survey were the regulatory system (93.75%), economic growth (75%), and relative insulation from the external market (68.75%). 75% our risk assessment systems. Public Sector Banks, Private Sector Banks as well as Foreign Banks view difficulty in hiring highly qualified youngsters as the major threat to their HR practices ahead of high staff cost overheads, poaching of skilled quality staff and high attrition rates. After the economic reforms in 1991 or post LPG era, banking has become one of the most sought after careers in India. Post liberalisation, many private banks came into prominence which further made a wide horizon of employment generation in the banking sector. The banking sector has undergone many changes. As the retail, housing, hospitality and education sectors are experiencing huge growth in the respective fields, the growth of banking sector is seemed to be manifolds. career are flourishing in the country in spite of more than 50% population of the country is unbanked. The worth of banking industry in India is about Rs 64 trillion. Still, about 41% of the population has no bank account. It means in the days to come, robust employment opportunities are expected. A career in the banking sector is lucrative both in the public as well as private banks. The sector has been fascinating for the youngsters for a long time. The students from the fields of commerce, economics, and finance can notch fatty packages from top banks. MBA degree along with graduation in finance subject is the added advantage to get a placement at the senior levels in the private sector banks. Growth and promotion are slow in public sector banks but have the security of jobs. However, in private sector banks, there is a healthy growth and promotion. If you are a graduate and MBA from reputed institutions, career growth is quite smooth in the private sector banks. Pay packages in the banking sector at both public and private depends upon nature of profiles and banks. For clerical jobs, it starts from Rs 20, 000/month. Working in a bank can be a great job choice. Whether you’re just looking for a temporary job or a long-term career, a bank job can help you advance professionally. There are numerous positions you can apply for as you can see from the list given earlier in this report, opportunities to advance in your career, and employee benefits you can enjoy. With a good resume and the necessary qualifications, you can achieve your goal of landing a bank job. Check the role you are applying for and the minimum qualification required. Generally, a clerical position requires a 12th pass and all other positions require a graduate/ Post graduate qualification. Talk to employees at local banks.If you’re trying to get a bank job, a good place to start would be your own bank. When you go in to do your banking, strike up a conversation with tellers and managers. After you get friendly, mention that you’re looking to work in banking. They might know of a job opening, be willing to refer you to someone else with more information, or simply give you career advice on moving forward. These personal relationships will be important as you advance in your career. Look on the internet for job postings.Businesses use websites like Naukri, Shine, Freshersworld etc to advertise positions. Take a look at these sites for bank jobs if you’re searching for a job. Investigate the bank you’re applying to.Whenever you apply for a job, you should do some research into the position and the company. Being knowledgeable about the job shows that you’re committed and willing to put work in. Once you have searched the companies and you like one or few of the job roles advertised then all you need to do is just click on the APPLY button. JFY team will get in touch with you to gather the 1st round on information and then if shortlisted will forward the CV to the client. If the client shortlists then the APP will show you the status and you will be informed about the final interview date. Once interview did JFY will follow up with the client to inform you if successful or not. SIMPLE. Let JFY do all the coordination on your behalf at no cost to you. 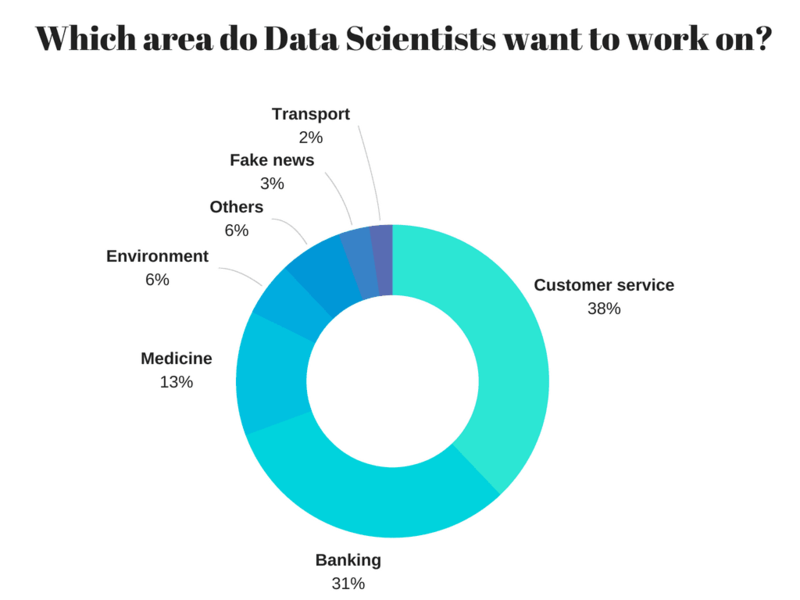 Indian and multinational companies from almost every industry — be it Fortune 500 name or a local startup — are hiring data science experts to help them garner insights from big data. The entire industry has seen a sharp increase in demand for highly-skilled professionals. Companies are also on a constant lookout for talented persons who can fill the gap. 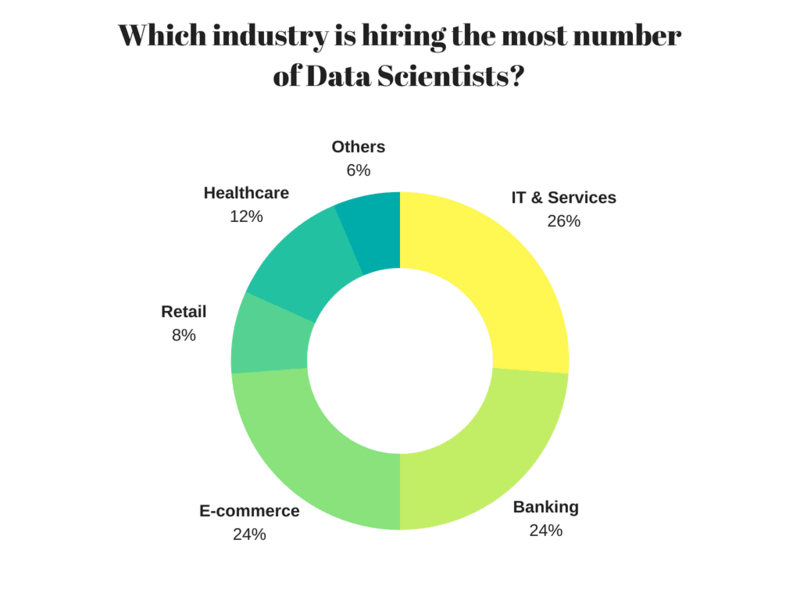 Our survey for June 2018 endeavoured to find out the current scenario of hiring trends and jobs available in data science. 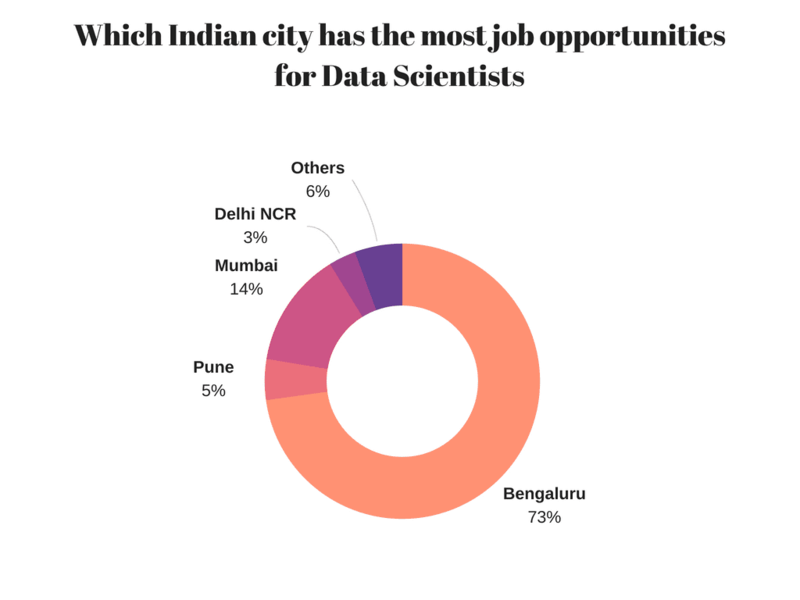 The data science sector is flourishing to such an extent that our earlier Jobs Survey published in association with Edvancer revealed that more than 90,000 job openings in data science and related fields are being advertised in India as of now. 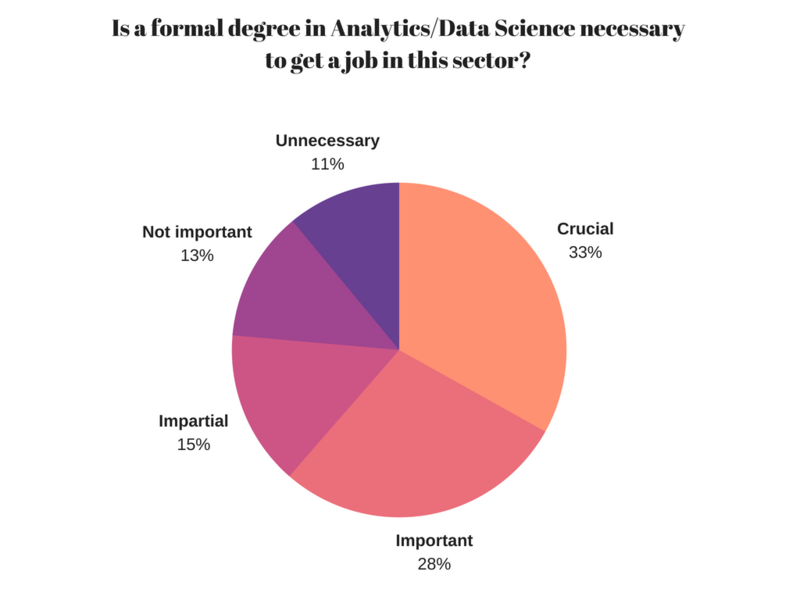 We asked our survey takers to tell us if a degree or formal education in data science was necessary to get a job in data science. The respondents clearly thought it was. 33% of respondents thought that formal education was crucial to get a job in this sector. This is in keeping with the current trend in the industry. 28.3% respondents thought it was important as it can be clearly seen by the increasing reliance by employees as well as students on MOOCs to keep themselves updated. Only a minority of the respondents — 11% — thought formal education was completely unnecessary. 48% of the respondents think that prior experience was important to get a job in the new tech sector. 29% respondents thought that it was crucial for their career. This is in line with what the organisations have been thinking. Most of the companies in new tech think that educating an employee for a basic skill like programming can be time-consuming and a drain on resources. 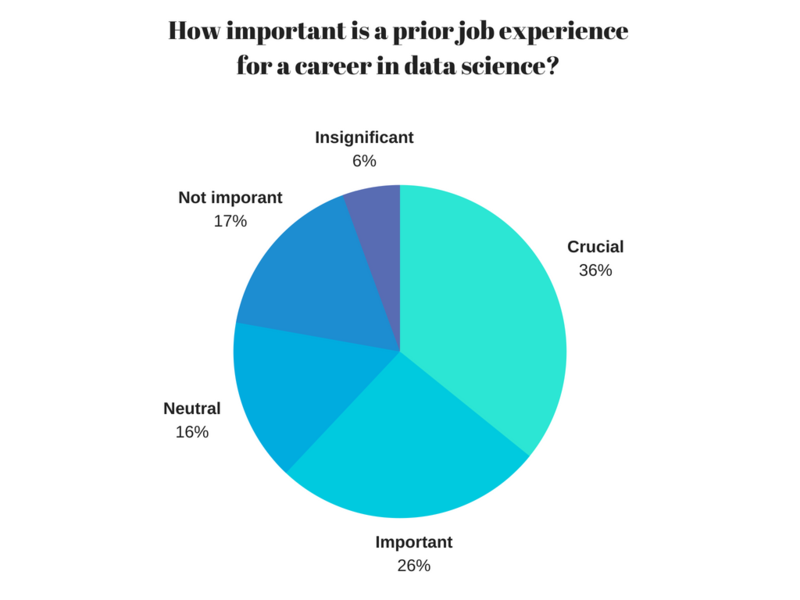 A clear majority of our respondents have shown that having an experience in a similar field is definitely helpful in landing a job in data science. 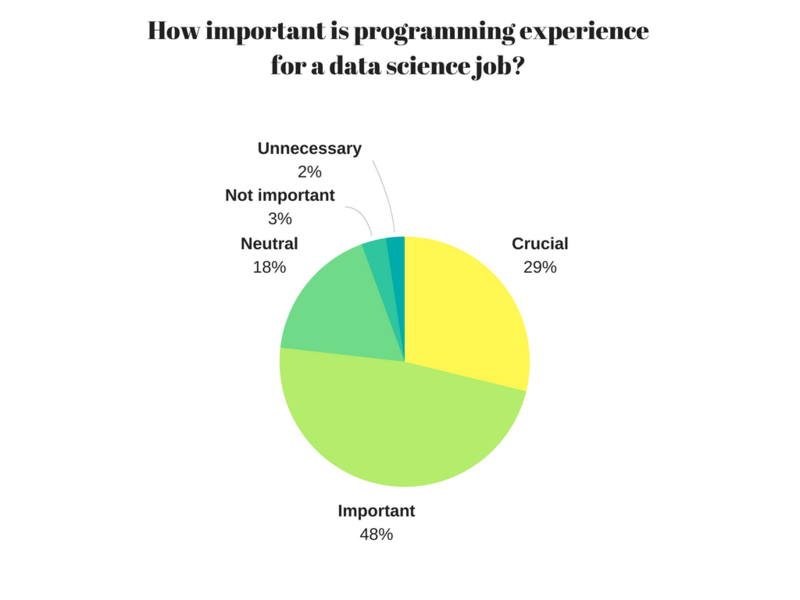 For example, a clear 35.8% people have said that a job experience is crucial in data science sector. Another 26.2% have said that it is important. This is in keeping with studies which have shown that a majority of companies in the analytics and data science sector prefer candidates with five or more years of work experience. Only 2% of the survey takers did not agree with the statement. This questions seemed to have stumped our respondents. Here, the answers seem of two polar opposite opinions. Firstly, almost 30% of the people did not have an opinion about the matter. 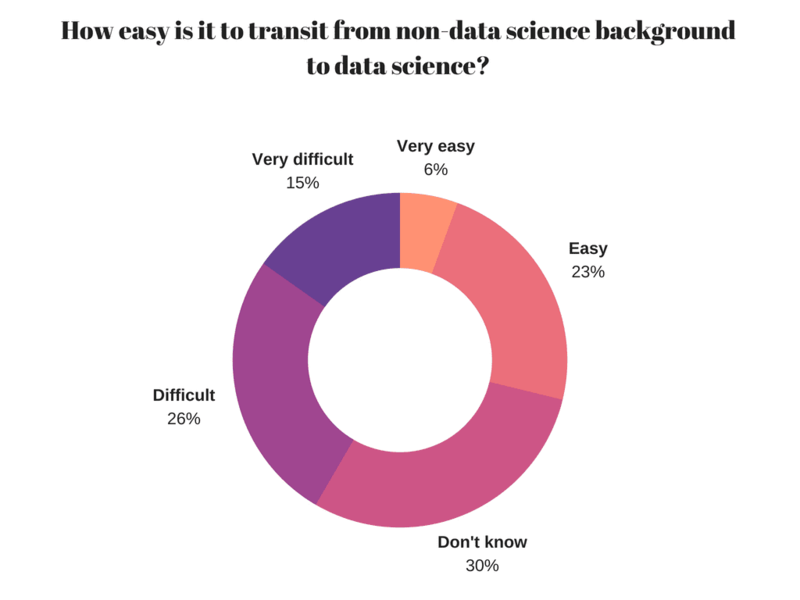 Otherwise, 15.2% of the respondents thought it was very difficult to make the transition from a non-tech background to data science. 23.2% thought it was difficult, but not impossible to do so. This response is clearly not surprising, given the great pace at which the industry is progressing. It is already hard for people in the industry to keep up with changing trends, and therefore jumping into a vibrant sector suca as data science is perceived as very difficult. On the other hand, only 5.6% people thought it was very easy to do so. This question had a clear-cut answer — perhaps because of the personal experiences of our respondents. 42.7% people thought that internship was the best way to make your way into a company. You make contacts, meet mentors and friends that last for a lifetime. 21.8% respondents voted joining data science communities or networking as the great way to get jobs. Having a mastery over one or more programming languages is considered a great asset in the data science and analytics community. Here, our respondents — job seekers as well as recruiters — had a clear idea about what languages were the most popular in the market right now. 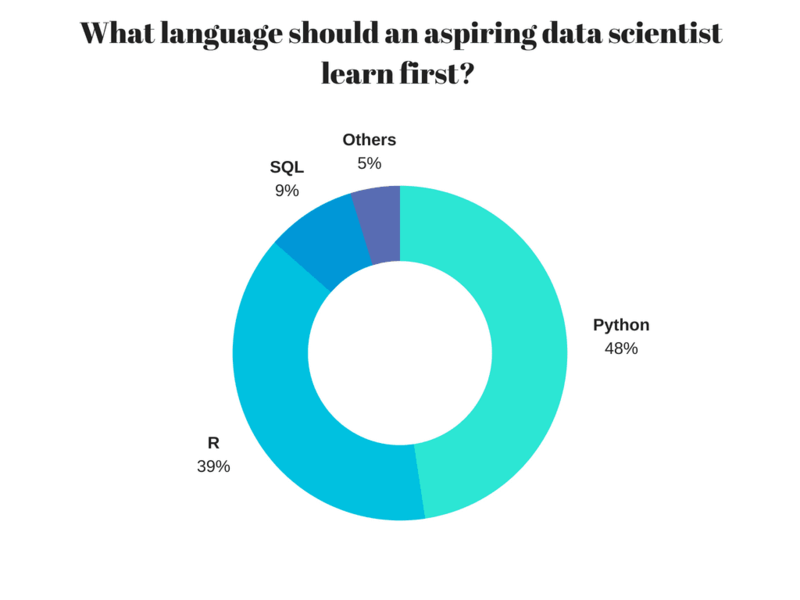 Python was clearly the most popular language for data science practitioners as well as learners. 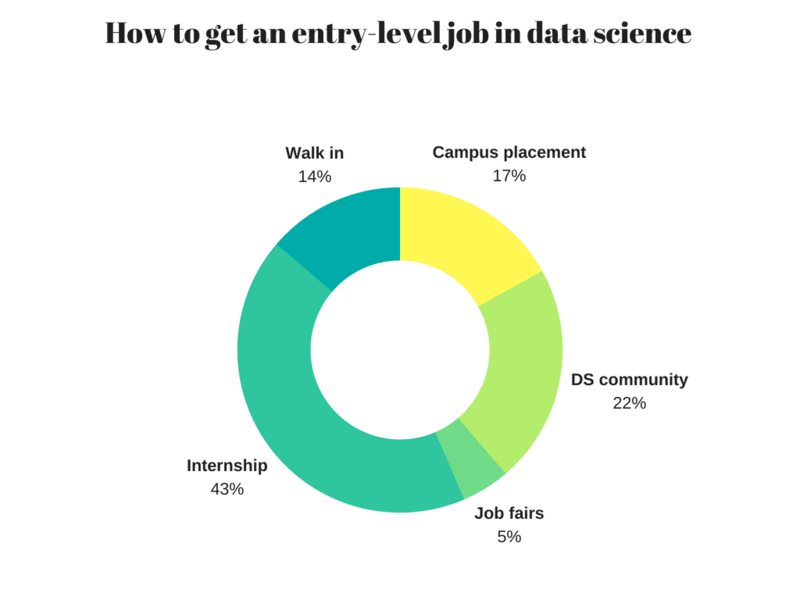 Over 47% respondents said that it was crucial for job seekers to know this language to get an opportunity in data science. 33% of the respondents relied on MOOCs extensively to upgrade their skills in new tech and keep themselves updated with emerging technologies. On the other hand, 28% used it frequently for the same purpose. Only 9% of the respondents said that they didn’t use MOOCs at all. Here, the answers were unanimous, as well as expected. 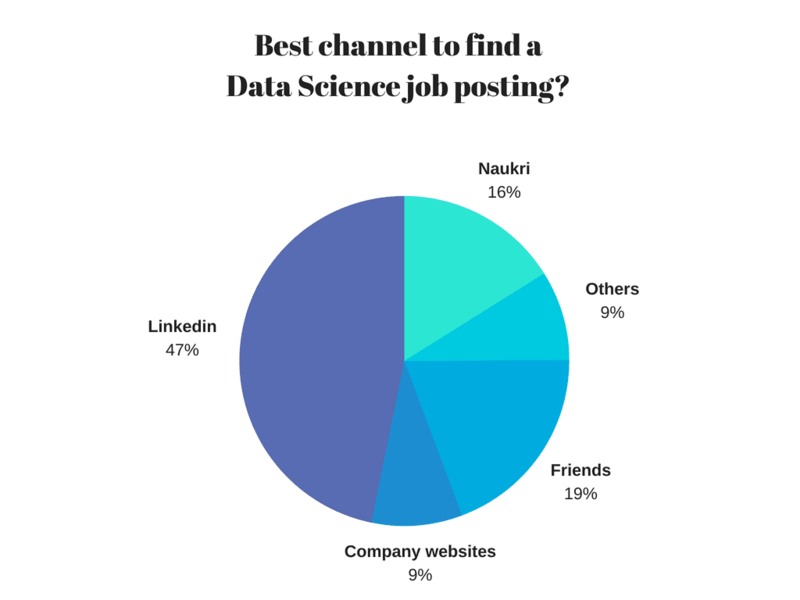 At 47.1% LinkedIn, the social networking website for professionals seems to be the first choice for looking for as well as posting a job in data science. The next popular way to find a job is checking with friends and acquaintances to look for employment opportunities at 19%. This question had a congruent, solid vote for Bengaluru with 73% of respondents saying that the Garden City had the best job opportunities in new tech. The next favourite was Mumbai at 13.9%. 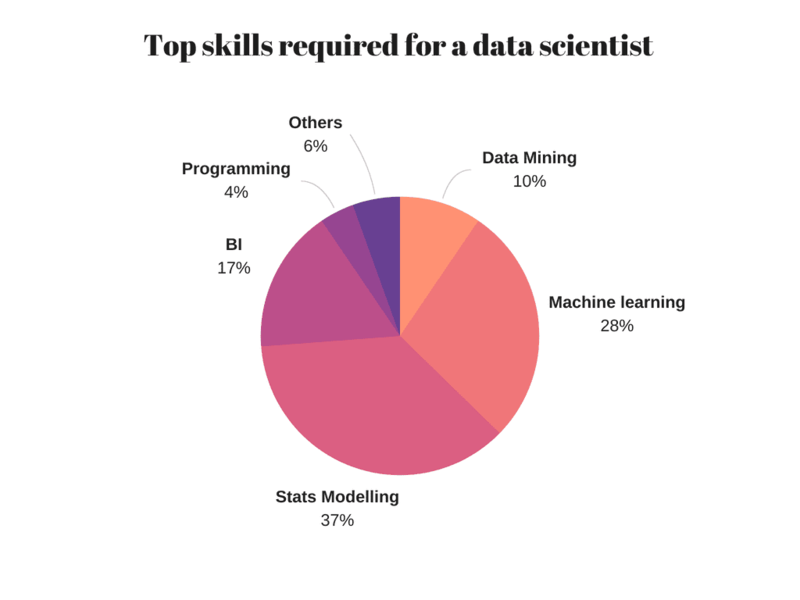 Data scientists are in great demand, as discussed above. The results are thus scattered across several sectors. Does your cover letter get read, or is it a waste of time? There are good reasons to include a cover letter, even when applying for jobs online. 1. It gives you another platform to market your skills and convey your interest in the company. 2. A well-done cover letter showcases your communication skills. 3. Hiring decision-makers read compelling cover letters. 4. A cover letter gives you more room to personalize your message to the employer or contact. 5. You can use a cover letter to address any gaps in your resume. 6. It can help you market your transferable skills. 7. A cover letter gives you a reason to keep your name in front of the hiring decision-maker. 8. You can employ creative strategies to link your value to the employer’s needs, painting a verbal picture that draws their attention. 9. It gives you a chance to make use of additional keywords that target the employer’s needs. 10. A cover letter provides closure by giving you a vehicle to ask for the job or ask about next steps. Have you got the key skills graduate employers look for? You’ll need to give examples of these essential competencies in your job applications and interviews to impress recruiters and get hired. Graduate employers place a lot of emphasis on finding candidates with the right skills and competencies for their organizations. Depending on the career sector and profession you choose to work in, there could be very specific skills, abilities, and knowledge needed to do the job. However, complementing these are general competencies and behaviors that are essential for successful working. These are the key employability skills – the core skills that will make you effective at work, whatever job you do. They are sometimes known as transferable skills because you develop them over time and take them with you as your career develops; think of them as your passport to career success. You’ll need to draw on your work experience to give evidence of these skills. 1. Commercial awareness (or business acumen): This is about knowing how a business or industry works and what makes a company tick. Showing that you have an understanding of what the organization wants to achieve through its products and services, and how it competes in its marketplace. 2. Communication: This covers verbal and written communication, and listening. It’s about being clear, concise and focused; being able to tailor your message for the audience and listening to the views of others. 3. Teamwork: You’ll need to prove that you’re a team player but also have the ability to manage and delegate to others and take on responsibility. It’s about building positive working relationships that help everyone to achieve goals and business objectives. 4. Negotiation and persuasion: This is about being able to set out what you want to achieve and how, but also being able to understand where the other person is coming from so that you can both get what you want or need and feel positive about it. 5. Problem-solving: You need to display an ability to take a logical and analytical approach to solving problems and resolving issues. It’s also good to show that you can approach problems from different angles. 6. Leadership: You may not be a manager straight away, but graduates need to show potential to motivate teams and other colleagues that may work for them. It’s about assigning and delegating tasks well, setting deadlines and leading by good example. 7. Organization: This is about showing that you can prioritize, work efficiently and productively, and manage your time well. It’s also good to be able to show employers how you decide what is important to focus on and get done, and how you go about meeting deadlines. 8. Perseverance and motivation: Employers want people to have a bit of get-up-and-go. Working life presents many challenges and you need to show employers that you’re the kind of person who will find a way through, even when the going gets tough… and stay cheerful-ish. 9. Ability to work under pressure: This is about keeping calm in a crisis and not becoming too overwhelmed or stressed. 10. Confidence: In the workplace, you need to strike the balance of being confident in yourself but not arrogant, but also have confidence in your colleagues and the company you work for. There are certain words which are key to catching an employer’s interest. Mention them in your CV and at interviews and see how impressed they are with your business-speak.